The Mongol warrior would often be travelling from place to place, and the Mongol camps and living style were built around this nomadic lifestyle. To survive this nomadic and campaign based lifestyle, the Mongol warriors used ancient mobile homes, known as yurts or as the Mongols called them gers. One element of the Mongol warriors and military that is often envisioned with the nomadic lifestyle is of the solitary warrior on horseback from battle to battle. Of course in reality nothing could be further from the truth, the Mongol camps were massive logistical solutions to the travel necessary. A travelling ordu, essentially a Mongol battle unit which would be comprised of 30,000 or more Mongol warriors, would of course have required much more than 30,000 men to travel. These additional workers would have been involved in the logistical side of travelling, and integral to the success of the Mongol armies. When making their long travels either to or from the battlefield, the Mongols would transport everything they needed to survive. Food, rations, clothing, weapons and of course the Yurts. All this material needed to be managed and moved effectively which meant using the resources the Mongols had available to them. Mongol horses were a primary source of transport, capable of not only carrying a Mongol warrior but many packs and bags. Camels were also popular for slower transport and capable of surviving on little water over a long journey in what could be truly testing climates. Horses however were still the primary and preferred method of transport. Legends tell us that a Mongol warrior would travel with up to and more than 10 horses on the road. 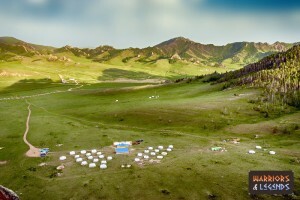 A Mongol warrior camp, with their many yurts littering the camp. Following behind the leading pack of horses and Mongol warriors would have been the campaign helpers and the livestock. The Mongols would trail livestock with them providing milk, meat and food sources along with them on their journeys. The Mongol warriors used what they referred to as a ger, but what you would likely call a yurt today. This mobile home, was a simple round construction that provided a shelter for the Mongol warrior on the move, and would have been constructed in under two hours. The construction of the ger was built from a wooden trellis wall, with a central roof piece held in place by two wooden poles. In-between these poles lay the fire pit of the stove allowing the smoke from the fire to exit via the hole in the central roof piece. roofing beams from the central roof piece to the trellis wall were next laid out providing the final piece of the ger structure. Next in the ger construction process would be the coverings which were typically make from a wool felt, wrapped over the roof and around the sides of the ger. The felt would be held in place by a network of ropes tied round the construction keeping it solid and protected from the elements outside. 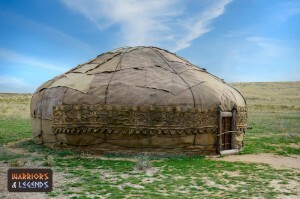 A Mongol yurt, the essential home for the nomadic Mongol warriors. After settling on a camp, the Mongols would start the construction of their gers, making sure their home would be ready for the cold of the night. Temporary corals would be made for the livestock, ensuring they would still be there come morning, and the food preparation and cooking would soon begin. Of course the most important part of camp life would be the rest and refuelling. Travel was hard, and while the Mongols were supremely skilled at it, it would likely still take their toll on them. Camp therefore would be used to offer respite from the riding and grind of their long travels, giving the Mongol warriors a chance to get their energy back. Travelling for many miles on horseback would surely have been difficult, especially when setting up a camp of the size the Mongols did. Not only managing the work involved in long distance travel, but carrying supplies and food for the 10,000 plus men and helpers would have been an immense challenge. Many historians have questioned just how did the Mongols manage such a feat, carrying enough food and supplies in what could be testing conditions and climates. The Mongols would obtain food from various sources, meat and dairy could be provided from their livestock. Goats and sheep were commonly used, cows too, and grains would be carried on horseback or camel back. Once a ger was set up, the Mongols would make cheese and curds and leave them on the roof of the gers to dry out. Legend actually tells that Mongol warriors were so dedicated and hardened they would survive for days on only the blood of their steeds should they have too. The Mongol camp was a hub of activity, warriors, helpers, family, animals and royalty. And they would all convene at the camp, finding solace from the grind of travels. The camp would be a place to rest, eat and let your horses regain their energy, the camp would essentially be a necessary break for all the Mongols.